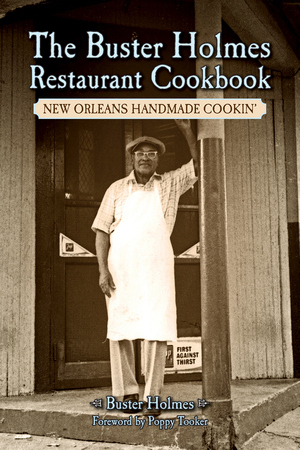 From the 1960s to 1983, Buster Holmes cooked up classic Creole food, ending his career in the restaurant that bore his name at 721 Burgundy Street. The restaurant, at the center of a thriving New Orleans cultural community, offered unlimited servings of its famous red beans and rice for a modest price alongside shrimp, gumbo, butter beans, and local game. Fans hungry for Holmes’ flavors can use his very own recipes and, while a pot of beans simmers, walk down memory lane with historic photographs, facts, and anecdotes about the restaurant and its beloved owner introduced by a new foreword from award-winning food historian Poppy Tooker. Poppy Tooker hosts the popular radio show Louisiana Eats! Her support of New Orleans cuisine has been recognized globally by the International Association of Cooking Professionals. Southern Living magazine named her a Hero of the New South. A writer for many publications, Tooker educates readers on the cultural histories that are pivotal to preserving Louisiana food culture. Her previous book Louisiana Eats! : The People, the Food, and Their Stories received the Literary Award of the Year in 2014 from the Louisiana Library Association. Tooker makes her home in New Orleans surrounded by the food history she loves. 38 b/w photos 37 illus.